Two weeks ago, I highlighted Minno's integration with SoundCloud for micropayments. The new service, founded by a pair of ex-Googlers, is hoping to tap into the growing market for in-app payments and premium social games and solve the complexity presented by today's solutions. This morning, the company is announcing a not so micro boost to their chances with the closure of a $700,000 seed round, including contribution from Farhad Mohit, the founder of Shopzilla, Jack Abraham, founder of Milo, and GRP partners. In parallel, the company is also changing its name to BuySimple and setting up shop at http://www.buysimple.com. The name change is more than cosmetic, helping the company evade a cybersquatter who thought Minno.com was worth exchanging high five figures for, which would certainly have put a dent into the seed round. It also captures the hope that Noah Ready-Campbell and Calvin Young have in making the long-discussed but rarely done well action of micropayments a simple one. Why will BuySimple be easy where other offerings have failed? In part, users don't need to create new accounts to use the service. They can tap into their existing Facebook accounts today, and imminent support for OpenID providers is promised. Merchants like SoundCloud and others are seeing the opportunity and already signing up. 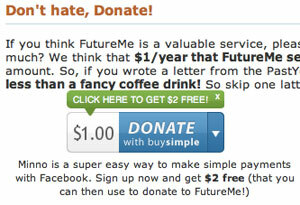 Early partners also include Hacker Monthly and FutureMe, who have posted buttons on their sites to enable users to donate using BuySimple or purchase digital editions of their magazine, right alongside the ubiquitous PayPal buttons. Unlike PayPal, who is tightly integrated with parent company eBay for auctions and all other sorts of online purchasing, BuySimple is focused on micropayments and making the process easy. During a beta period, the company promises that qualifying partners can tap into the product free. New users get two dollars credit on initial use. BuySimple is not affiliated with BankSimple, the new banking startup founded by former Twitter engineer Alex Payne.